Where I grew up in New Jersey, game day is serious business. Whether a potluck year with neighbors cozied up around the TV, or just me and the ‘rents, the Super Bowl has always been a Sunday of comfy clothing, raucous laughter, fun-spirited (both of the metaphorical and, for the adults, alcoholic variety) rivalry, and classic comfort foods like buffalo wings with creamy blue cheese dipping sauce. P.S. 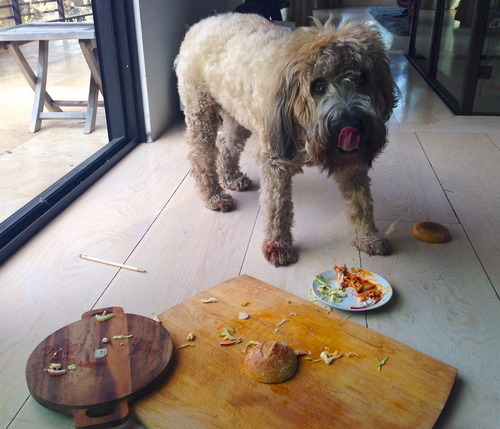 – Judging from the way Eleanor attacked the food shoot when we turned our backs, dogs like ‘em too! Place entire chicken in large stock. Add water to cover the chicken by a couple inches, bring water to a boil, then reduce to a rolling simmer and allow to cook for 45 minutes or until the juices run clear. Shred chicken. 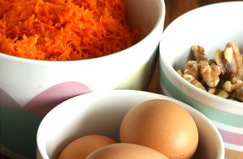 Shred the poached chicken. 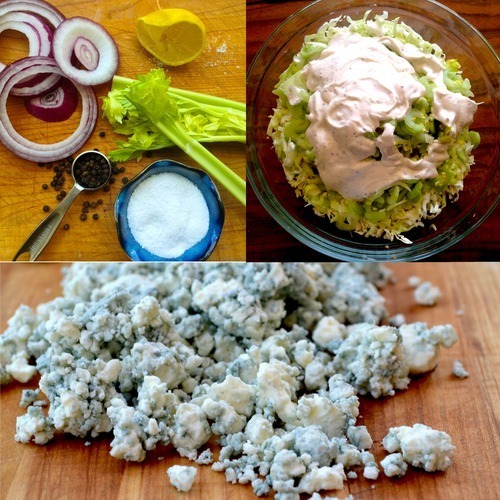 For the gorgonzola slaw, julienne all vegetables in a food processor and place in a large bowl. In a separate bowl, mix mustard, mayonnaise, celery salt, gorgonzola, and red wine vinegar, then add to the dry slaw and stir until mixed. Set aside. Heat oven to 350 degrees, and warm rolls. Melt the butter, then mix in the hot sauce as well as the salt and the worstershire. Remove from heat, add tapioca starch, and whisk until the sauce thickens, then add sauce back to the pan and heat another minute. Place the pulled chicken in the same pan as the buffalo sauce, and stir until the chicken is coated entirely and warmed through. To assemble the sliders, open a roll and spoon a generous portion of the chicken onto the bottom half of a roll, then slather with gorgonzola slaw. Top with other half of roll, toothpick, and devour! POACHED CHICKEN PREP TIME: 45 minutes or until the juices run clear. TOTAL SLIDER COOKING TIME: 30 minutes. I saw you on the Today show and liked your Buffalo Chicken sliders. In looking at you recipe on the web page, I have a quick question. The ingredients call for 5 whole chickens. Is this correct. It seems to be quite a bit for the 6 to 8 sliders buns. I am going to make these and the slaw for our Labor Day cookout. Thanks for your help and the recipe! Thank you for noticing this mistype. It's been corrected. 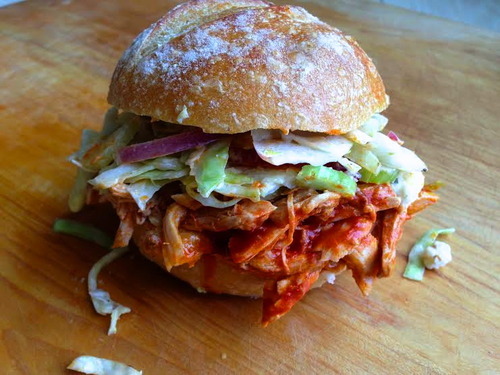 Making your buffalo chicken sliders tonight for the Cowboy vs. Giant game! Game starts in 1 minute! Go Cowboys!!!! 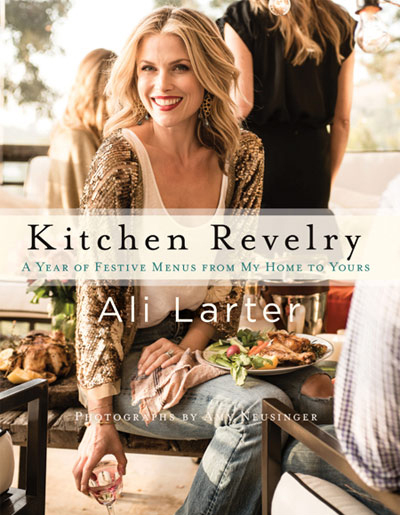 Hi Ali! Thank you so much for this recipe. You mention a whole chicken above, but I'm wondering if you could provide an estimated weight? I'm just unsure how big of a chicken I need to poach in order to serve 4 people with this meal. Thanks again! I think a 3-4 pound chicken would suffice. Depending on your portion sizes, you can set the breasts aside for another purpose and just shred and use the dark meat for this recipe. Thanks!